You are here: Home / Blog / Food Swaps / Eating an Apple a Day? While the phrase has been traced back to 1922, it was likely based on observation. Chinese Medicine (also observational) has long taught that apples strengthen the heart, quench thirst, lubricate the lungs, decrease mucus and increase body fluids. Apples can help to sharpen memory – a 2004 study at Cornell University found that the antioxidant quercetin (found in the apple skin) helps prevent oxidative stress, which damages brain tissues and is associated with neurodegenerative disorders. Apples can reduce your risk of Type 2 diabetes – in a large study at California State University, Sacramento, eating an apple a day was linked to a 28% lower risk of Type 2 diabetes, possibly due to the polyphenol antioxidant content. 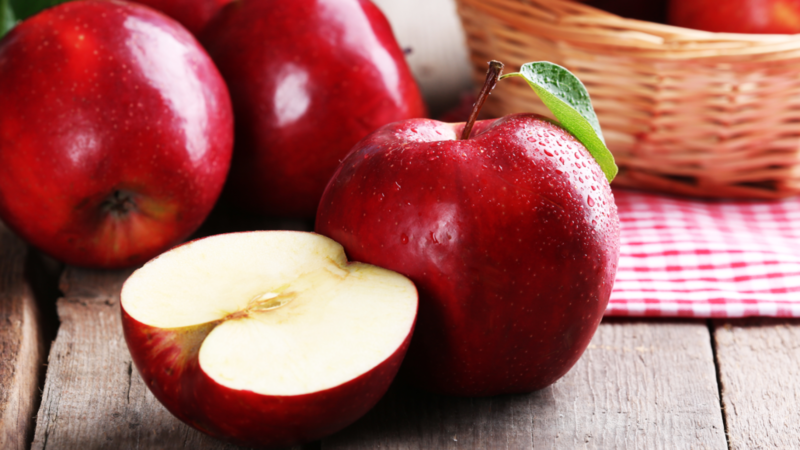 Apples increase your energy – a great source of simple carbohydrates, which can be turned into energy quickly. Add a healthy fat source such as pistachios or peanut butter to feel full longer. Apples nourish good gut bacteria – the fiber in apples isn’t absorbed in the small intestine, but is passed into the colon where it feeds good bacteria that supports a strong immune system. Eating one apple a day was found in a study from Ohio State University to greatly reduced participants’ levels of oxidized LDL cholesterol which raises inflammation and prompts atherosclerosis. It might also encourage you to hear that eating an apple before a meal daily can also help you lose weight! We read all sorts of recommendations for improving our health. Some of these may seem extreme, or simply out of the ordinary for you. How refreshing to find that something as simple as an apple a day can offer so many benefits! What is your favorite type of apple? They are in season in North America. You can try red, green, or yellow ones that are soft or crisp. Find what you like, wash it and take a bite! Inflammation … Friend or Foe? Got Milk? Do You Need It?